McReynolds gained fame as a winning crew chief for Dale Earnhardt, Davey Allison, Ernie Irvan, Dale Jarret, and several other top drivers. But before getting to the Cup level, he was a short track racer from Alabama. He understands short track race car setup technology. This book is written by a Cup level winning crew chief and chassis expert, but it is oriented to the needs of short track racers. McReynolds openly shares his chassis knowledge, setup information and tech insights. 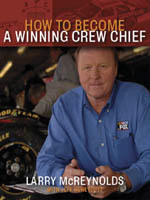 There are a lot of pratical tips and important advice included that can only be learned from a seasoned successful crew chief. Larry shares a wealth of setup and handling information that has been learned from hundreds of track testing days. He tells you very quickly what works and what doesn't. There is an incredible amount of information contained in this book.